Bute In Bloom members celebrate the group's triumph at the 2015 Beautiful Scotland awards. Entries have opened for this year’s Beautiful Scotland competition - as communities across the country seek to capture the crown won by a Bute community group in 2015. The campaign, and its sister ‘It’s Your Neighbourhood’ initiative, aimed at smaller community projects, are both managed by environmental charity Keep Scotland Beautiful, which wants groups from Argyll and Bute - and across Scotland - to register to take part in this year’s competition. 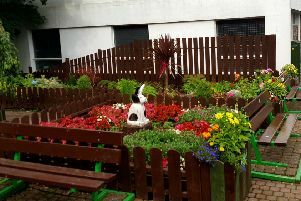 The Bute In Bloom community group carried off the top Beautiful Scotland prize, the Rosebowl, at the 2015 awards ceremony in Perth in September - and took home the Best Coastal Town and Community Involvement prizes too. Derek Robertson, chief executive of Keep Scotland Beautiful, said: “All year round, communities from across Argyll and Bute are doing their bit to ensure local spaces are clean, green and beautiful, and all too often these efforts are overlooked - yet the economic value of the hours people in Scotland volunteer stands at almost £3 million a year. Online registration for both campaigns is now open. Further information can be found at the Beautiful Scotland and It’s Your Neighbourhood websites.